I received a request to post the recipe I used for the lemon brownies I made on Sunday. I'm not kidding people, these are so delicious. 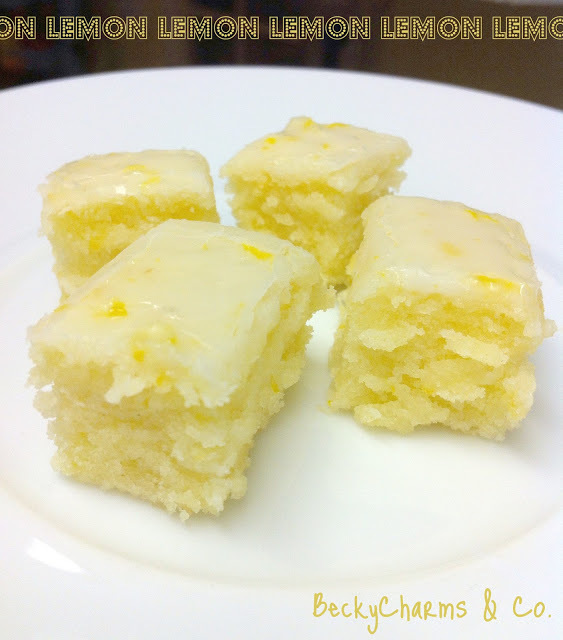 If you love lemon like me, make these! Plus, it certainly not a difficult recipe either. Preheat oven to 350°F. Grease/Spray an 8-by-8-inch baking dish with butter/cooking spray and set aside. In a separate bowl, whisk together the eggs, lemon zest, and lemon juice until combined. Pour into the flour mixture and beat at medium speed until smooth and creamy, about 2 minutes. When brownies are cooled completely, make the glaze...sift the powdered sugar, add lemon zest and juice, and whisk together all three ingredients. Spread 1/2 the glaze over the brownies with a rubber spatula. Let glaze set. Spread the remaining glaze over the bars, and let it set. This glaze does not harden like most. Cut into bars, and serve! THANK YOU! Totally making these this weekend!